The Law Office of Laura S. Outeda, Esq. opened in January 2009 and is located in Jackson Heights, Queens, New York. 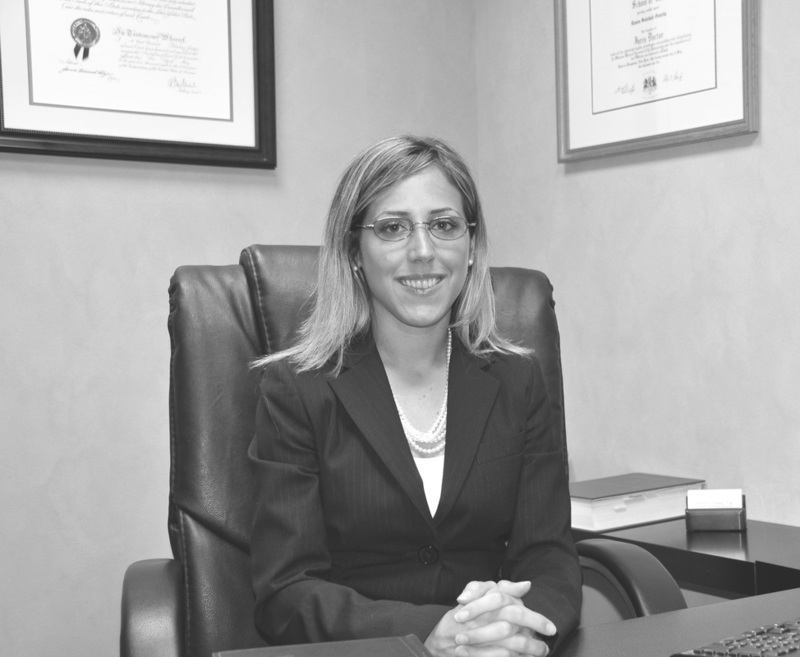 About ATTORNEY Laura S. Outeda, Esq. LAURA S. OUTEDA, ESQ. is an Attorney & Counsellor-At-Law Admitted to Practice Law in New York State, OCA Registration No. 4577425. She is of Hispanic origin and resides in New York City since the year 1993. Attorney Outeda is an active member of numerous professional organizations and frequently provides legal commentary to the media, including Univision, Telemundo, NTN24, and NY1. Attorney Outeda represents clients in different types of cases both simple and complex. Her practice areas include, but is not limited to, immigration and naturalization, matrimonial matters, prenuptial agreements, divorce, family court, estate matters, wills, powers of attorney, health care directives (living will, health care proxy, durable power of attorney for health care), apostilles, will probate & administration, landlord & tenant, civil court, litigation, contracts/commercial matters/corporate law, legal consultations and more. Attorney Outeda is a member of the New York Bar admitted to practice law as an Attorney & Counsellor-At-Law. 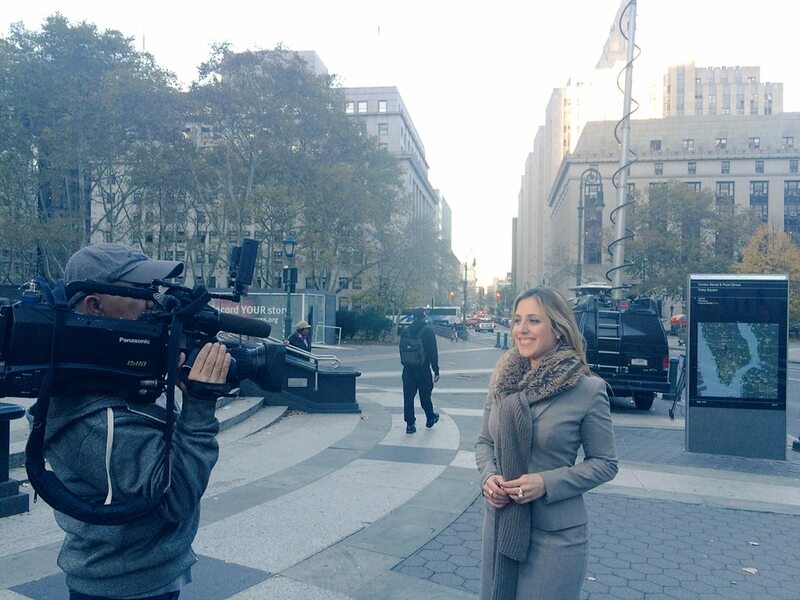 She is also admitted to practice before the U.S. District Courts for the Southern and Eastern Districts of New York. Attorney Outeda is also duly licensed by the New York Department of State, Division of Licensing Services, to transact business as a Real Estate Broker. Attorney Outeda received her Juris Doctor (J.D.) in 2005 from Hofstra University School of Law. Ms. Outeda obtained a Bachelor's Degree in 2001 from Hunter College - The City University of New York with honors - Dean’s List every semester (“Speaking from the White House on January 9, 2014, as he honored a Hunter student who had overcome adversity and demonstrated great academic achievement, President Barack Obama called Hunter "one of the best colleges in the country"). To better serve her clients and to continue evolving her practice Ms. Outeda keeps her skills and knowledge up to date through a number of ways including continuing legal education. Attorney Outeda was appointed by Arthur Aidala, President of the Brooklyn Bar Association, and served on the Assigned Counsel Screening Committee for the Family and Supreme Court. She is also an elected Board Member of the Latino Lawyers Association of Queens County serving since 2016 and a pro-bono arbitrator in the New York Civil Courts. American Immigration Lawyers Association (AILA) – a national bar association founded in 1946 and comprised of attorneys who practice and teach immigration law. AILA Subchapters: New York (primary); Latin America and Caribbean; Rome District. AILA New York Chapter Committees: Advocacy/Media; CBP; Consular Practice; EOIR/OPLA/Asylum; Federal Practice; ICE; Practice Management (Chair 2015-2017); Pro Bono (2009-2015); Social (Chair 2010-2015); UPL & Ethics. TV interview by NTN24 (MARCH 13, 2015) . NY1 NOTICIAS (MAY 29, 2015). NY1 NOTICIAS (MAY 2016) - Attorney Laura S. Outeda is interviewed by News Reporter Fabiola Galindo. UNIVISION (MARCH 2016) - Attorney Laura S. Outeda is interviewed by News Reporter Nayeli Chavez Geller. UNIVISION (NOVEMBER 2015) - Attorney Laura S. Outeda is interviewed by Birmania Rios for the TV show "Despierta America" of Univision Noticias. NY1 NOTICIAS (MAY 29, 2015) - Attorney Laura S. Outeda is interviewed at PURA POLITICA by Juan Manual Benitez - NY1 News Studios. NTN24 (MARCH 13, 2015) - Attorney Laura S. Outeda is interviewed by NTN24 about issues and updates with the immigration laws. 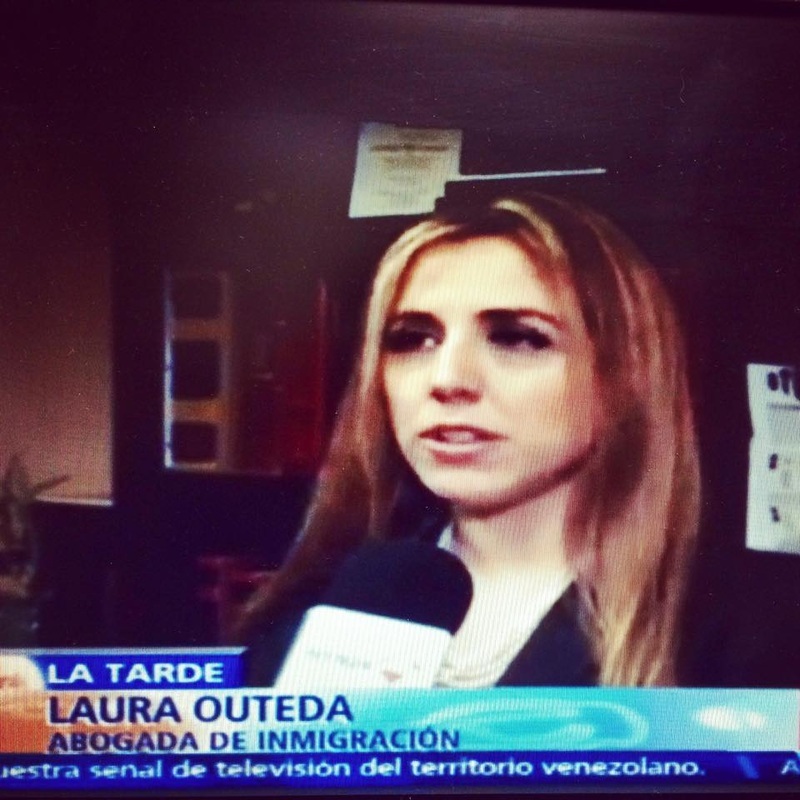 TELEMUNDO 47 (NOVEMBER 26, 2014) – Attorney Laura S. Outeda responds questions from TV viewers about immigration law. TELEMUNDO NOTICIAS (NOVEMBER 21, 2014) – Attorney Laura S. Outeda is interviewed by Liz Gonzalez at Telemundo Responde concerning Obama’s plan for executive action. Ms. Outeda also answered questions from TV viewers concerning Obama’s announcement. / La Abogada Laura S. Outeda fue entrevistada por Liz González de Telemundo Noticias sobre la Acción Ejecutiva del Presidente Obama. La Abogada también respondió preguntas de los televidentes sobre inmigración y la acción ejecutiva anunciada por el Presidente Obama el 20 de Noviembre del 2014. TELEMUNDO RESPONDE (NOVEMBER 20, 2014) – Attorney Laura S. Outeda appeared on Telemundo Responde to answer general immigration questions from TV viewers in anticipation of Obama’s announcement of his plan for Executive Action. / La Abogada Laura Outeda estuvo en Telemundo Responde, contestando preguntas de televidentes en anticipación del anuncio del Presidente Obama sobre la acción ejecutiva la cual beneficiaria unos 5 millones de inmigrantes. UNIVISIÓN (FEBRUARY 14, 2014) – Attorney Laura S. Outeda was interviewed at Primer Impacto, Univisión Communications, New York, by News Reporter Nayeli Chávez-Geller. / La Abogada Laura S. Outeda fue entrevistada en Univisión por la reportera Nayeli Chávez-Geller para Primer Impacto. 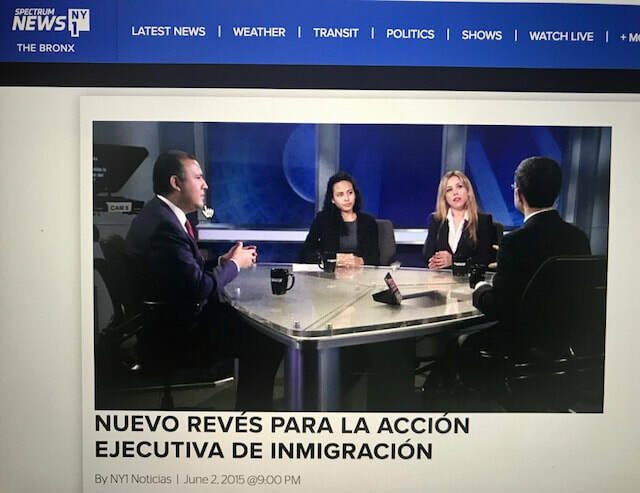 UNIVISIÓN (AUGUST 1, 2013) – Attorney Laura S. Outeda was interviewed at Univision Communications, in New York, on how to prevent being a victim of immigration fraud, by Nayeli Chávez-Geller. / La Abogada Laura S. Outeda fue entrevistada en el programa de televisión Primer Impacto, por la reportera de Univision Nayeli Chávez-Geller sobre Cómo tomar precauciones para no ser víctimas de fraude de inmigración. NY1 NOTICIAS (AUGUST 28, 2012) – Attorney Laura S. Outeda was interviewed by Juan Manuel Benítez, Host and Executive Producer of Pura Política, NY1 Noticias on Deferred Action for Childhood Arrivals. / La Abogada Laura S. Outeda fue entrevistada por Juan Manuel Benítez, Reportero y Presentador de NY1 Noticias, y explicó en detalle el Programa de Acción Diferida del cual se pueden beneficiar jóvenes indocumentados. At the studios of NY1 Noticias with Juan Manuel Benitez. NY1 NOTICIAS (AUGUST 28, 2012). BROOKLYN BARRISTER (SPRING 2015) – Young Lawyer Spotlight: Laura S. Outeda, Esq., by Andrew Cabasso, Esq. LA RAZÓN NEWSPAPER (FEBRUARY 20, 2014) – Attorney Laura S. Outeda was interviewed by Marta Torres, New York Correspondent at La Razón Newspaper, in New York, concerning Political Asylum. / La Abogada Laura S. Outeda fue entrevistada para el periódico La Razón, por Marta Torres, corresponsal en Nueva York, sobre la ley y temas de asilo político. PUBLIMETRO NEWSPAPER (AUGUST 15, 2012) – Attorney Laura S. Outeda was interviewed by New York Correspondent Angelica Pena, for Publimetro Newspaper, Mexico, concerning updates with the immigration laws and Deferred Action for Childhood Arrivals. / La Abogada Laura S. Outeda fue entrevistada para el periódico Publimetro, Edicion Mexico, sobre el programa de inmigración de acción diferida para beneficiar a los jóvenes indocumentados. La entrevista fue realizada por la periodista Angélica Pena, Corresponsal para Publimetro, New York. CONSULATE OF COLOMBIA IN NEW YORK (OCTOBER 29, 2013) – Attorney Laura S. Outeda is invited by the Consulate of Colombia in New York to give presentation concerning Family Law & Immigration Law: How to Avoid Immigration Fraud and Topics Related with Family and the U.S. Immigration System. / La Abogada Laura S. Outeda es invitada en el Consulado de Colombia de Nueva York para educar a la comunidad latina de sobre Cómo Prevenir el Fraude Migratorio y sobre Temas Relacionados con la Familia y el Sistema Migratorio de Estados Unidos. Manhattan, New York. BNI ADVANTAGES (OCTOBER 29, 2014) – Attorney Laura S. Outeda gives presentation to several business owner on business immigration law and other legal subjects / La Abogada Laura S. Outeda da una presentación informativa a dueños de comercios sobre cómo regularizar estatus migratorio. Queens, New York. NEW CHURCH INTERNATIONAL (JANUARY 29, 2015) – Attorney Laura S. Outeda is invited to participate in an Open Forum, moderated by Priest E. Malave where she responded questions from the community on the subject of immigration law/ La Abogada Laura S. Outeda es invitada a participar en foro abierto para responder preguntas de la comunidad latina y proporcionar información sobre leyes de inmigración (moderador fue Pastor E. Malave) Brooklyn, New York. BLESSED SACRAMENT SCHOOL (APRIL 7, 2015) Attorney Laura S. Outeda supervises law students giving presentation about DACA, expanded DACA, & DAPA and answers questions from the audience. / La Abogada Laura S. Outeda supervisa a estudiantes de abogacía en presentación sobre inmigración en reunión de padres de la escuela Blessed Sacrament School en Brooklyn, Nueva York. Attorney LAURA S. OUTEDA speaks at the Consulate of Colombia.